Skeletons are not the only things to emerge from a Halloween weekend screening of House on Haunted Hill. Good news: William Castle, the master of cinematic suspense and inventor of the greatest audience-pleasing gimmicks in movie history, has come back from the dead. "I can confirm that," the director's grandson Kyle Castle Newall said Friday night at the Loew's Jersey Theater in Jersey City. "Indeed he has." 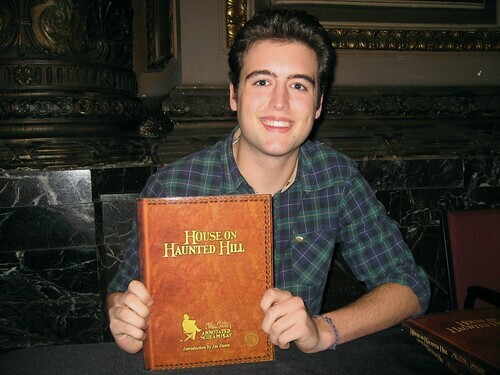 Newall, an NYU student who was born after his grandfather died - or rather, after he died the first time - was in attendance for a screening of Castle's 1959 classic House on Haunted Hill, wherein a flying skeleton torments attendees at a party thrown by Vincent Price. And, in a move that must have put a nostalgic bounce in the newly undead director's step, Loew's Jersey recreated Castle's infamous EMERGO! effect, complete with an actual skeleton floating above the live audience. "Every theater was equipped with EMERGO! at the time (of the film's initial release)," Newall said in a post-show Q&A. "Back then, there wasn't one big opening weekend. They would have openings in different cities, so my grandpa was able to be in the audience and see the reaction and see that everything went right." If William Castle was in attendance on Friday - and evidence suggests he was - he would likely have been pleased by both the return of EMERGO! and the historic setting of the Loew's. After narrowly avoiding the wrecking ball in the 1980s, the once-majestic movie palace was rescued, refurbished and reopened in 2001, thanks to the ongoing efforts of an army of volunteers. And those film lovers worked their fingers to the bone to bring Castle's spooky vision back to life. "When we first decided to run the movie, everyone said, 'You gotta do it in EMERGO!" said Colin Egan, longtime director of the Friends of the Loew's. "Two of our stage people spent an entire Saturday putting it together and rehearsing it, and it was a lot of fun." Fun indeed. At the moment in the film (SPOILER ALERT!) 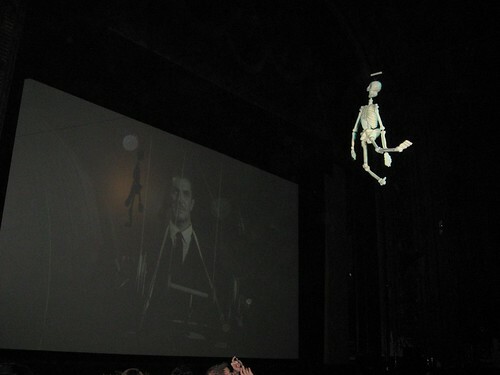 that malevolent millionaire Frederick Lauren (Vincent Price) is shown "reeling in" the bogus skeleton he has just used to murder his wife, a six-foot-tall plastic skeleton popped out from behind the Loew's' 50-foot-screen. Rigged on a wire and illuminated by a spotlight from the balcony, the skeleton danced above the heads of the audience for just under a minute, then disappeared back behind the stage right curtain. It was short, sweet and flawlessly executed. In order to maximize impact, other theaters reviving EMERGO! have triggered the effect a minute earlier, when the skeleton first appears on screen to taunt the evil Mrs. Lauren (Carole Ohmart). In this reporter's opinion (and this reporter has posters from four William Castle films hanging in his apartment, so he knows what he's talking about), the narrative integrity of the film is ruined if you launch the gimmick too soon, before the audience discovers that the skeleton in the movie is a fake. Not only that, it distracts the viewer during a key plot point. "If we did it earlier, you'd be missing the action on screen," Egan agreed. "But there seems to be no consensus, at least among people we talked to, on exactly where in the movie [the effect] was supposed to be. We looked at YouTube and saw how other places did it and we decided that's the place that made sense." Now that the inventor of EMERGO! has re-emerged from his heavenly sojourn, perhaps he can weigh in with a definitive opinion. Although he may be too busy. Castle has two new books out, which is quite an accomplishment for a man who died of a heart attack in 1977. 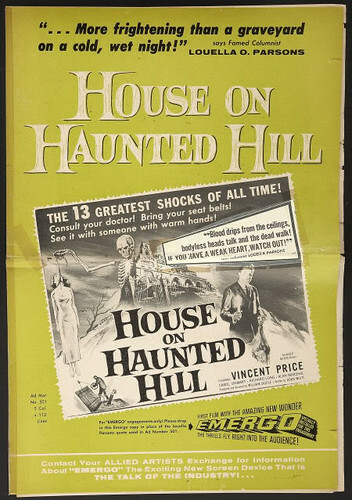 The first is a just-released reproduction of Robb White's screenplay for House on Haunted Hill, marked up with Castle's handwritten shooting notes, and including a print version of the EMERGO! gag. Kyle Newall's no-longer-dead grandpa also has written a new novel, appropriately entitled From the Grave. "It's a really fun read," Newall said. "It showed up on our doorstep mysteriously one night and we had to release it. Now copies are appearing everywhere." "I'm not entirely sure," he whispered, looking over his shoulder. "But the EMERGO! skeleton did seem to be answering to the name 'Mr. Castle.'"